I climbed Tievealehid (Taobh an Leithid) on 30 July 2009. I started at B855227 A, with ample parking for 2/3 cars and followed the access road up to the Wind Farm on the slopes of Malaidh Na Leacht and then on up over the peaty moorland to the top. The top of Malaidh Na Leacht is littered with small cairns with no apparent purpose! My route continued NE over Pt395 ( with more cairns ) then around in a NNW direction to Tievealehid summit marked by a Trig Pillar. In spite of frequent peat hags the going was generally good with many opportunities to make progress in and through the many troughs through the hags. The 360 degree panaorama from the top is magnificent . N over Bloody Foreland hill is Tory Island while to the SW Aranmore is in full view with the line of the Blue Stacks clearly seen further to the S. Best of all are the views E to the full range of the Donegal Highlands from Muckish to Errigal and from Dooish to Slieve Snaght. 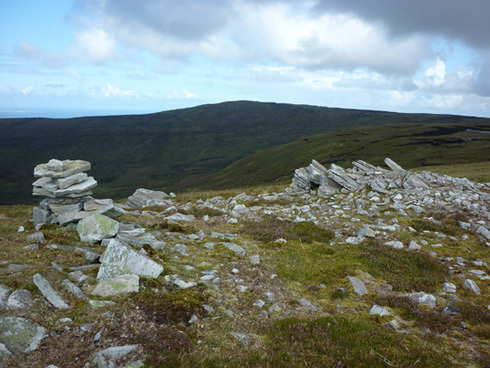 From the top I headed SE to Carntreena (Carn Traonach) which has a rockey rounded top with an expansive summit cairn. On the way up I deviated a couple of hundred metres to the left (NNW ) to take in a rockey promontory with a summit cairn. To return to my starting point I headed down SE to cross the Cromore Burn before ascending over the southerly shoulder of Malaidh na Leacht to the Wind Farm and the track back down to the start point.